Rich in nutrients that promote health, spinach makes a good addition to anyone's diet. While spinach itself does not cause diarrhea, it may not make the best food choice when you have loose stools. Spinach is not only a good source of vitamins and minerals, including vitamins A and C and iron, but it is also low in calories and a good source of fiber. A 1-cup serving of cooked spinach contains 41 calories, 0.5 gram of fat, 5 grams of protein, 7 grams of carbs and 4 grams of fiber and meets 377 percent of the daily value for vitamin A, 29 percent of the daily value for vitamin C and 36 percent of the daily value for iron. Spinach also contains phytochemicals that may offer protection against cancer and inflammation. Fiber is a nutrient found in foods like spinach that offers benefits to your digestive tract. There are two types of fiber: soluble and insoluble. Soluble fiber absorbs water and slows down movement through the digestive tract, which is beneficial if you have diarrhea. Insoluble fiber adds bulk to stool and speeds up movement through your digestive tract, which may increase diarrhea. Spinach contains both soluble and insoluble fiber, but has twice as much insoluble fiber as soluble fiber. The amount of soluble fiber you need to consume to decrease diarrhea is not known. However, spinach is not as good a source of soluble fiber as other foods, such as beans and oatmeal. In September 2006, fresh, bagged spinach sold in the U.S. was contaminated with E. coli, a bacteria that can cause diarrhea. 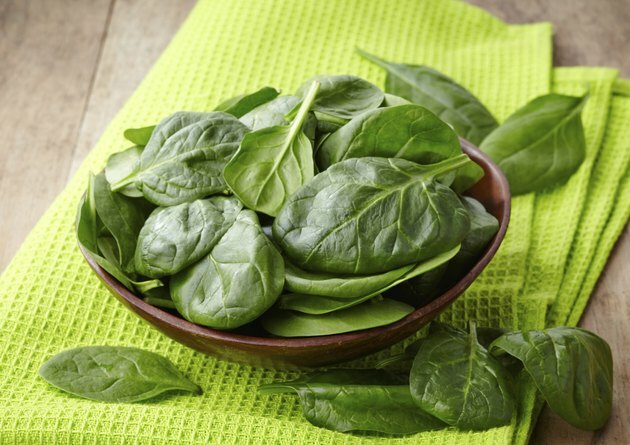 The spinach made 199 people sick in 26 different states, according to the Centers for Disease Control and Prevention. While this was an isolated incident, it is important to be aware of such outbreaks. While spinach does contain some soluble fiber, you may want to avoid eating it until your diarrhea has resolved. The diet recommended for diarrhea is a soft, bland diet that includes foods such as bananas, plain rice, boiled potatoes, cooked carrots, dry toast and skinless baked chicken. It is generally recommended that you avoid foods high in fiber when you have diarrhea. Hydration is also important when you have diarrhea, so be sure to drink plenty of water, sports drinks, fruit juice or broth. Do Spinach and Lettuce Make a Newborn Gassy During Breast-feeding?